This coin is the ninth in a series that features the wildlife of Rwanda. Invest in a hard asset with a unique theme! The obverse features the National Seal of Rwanda, along with the motto which translates as "Unity, Work, Patriotism". The reverse displays a family of three meerkat standing at attention. The right of the field is an outline of the continent of Africa. The meerkat is an insectivore, and they search for their food while one of them stands guard. This a rare and interesting addition to any wildlife collection. 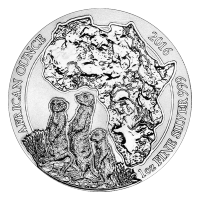 Reverse Famiglia di Suricati in posizione vigile, il profilo del continente africano, le parole "African Ounce 2016 1 oz Fine Silver 999"
Famiglia di Suricati in posizione vigile, il profilo del continente africano, le parole "African Ounce 2016 1 oz Fine Silver 999"
Moneta in Argento 1 oz 2016 Ruanda Suricate Africano This coin is the ninth in a series that features the wildlife of Rwanda. Invest in a hard asset with a unique theme! The obverse features the National Seal of Rwanda, along with the motto which translates as "Unity, Work, Patriotism". The reverse displays a family of three meerkat standing at attention. The right of the field is an outline of the continent of Africa. The meerkat is an insectivore, and they search for their food while one of them stands guard. This a rare and interesting addition to any wildlife collection.